Now is the time to organize your enclosed trailer for race season. 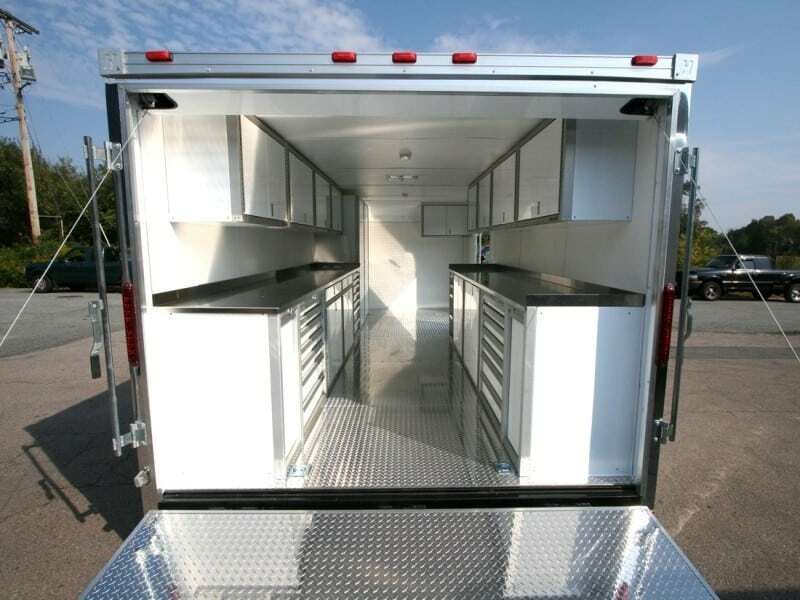 Getting aluminum cabinets for trailers is a great place to start. Installing new cabinets can give your trailer a fresh, customized look. Moduline Cabinets offers fully customizable, professional grade aluminum cabinets for mobile applications. Cabinets can help you maximize space in your trailer. All your supplies can be safely stored and organized. There are a variety of styles and colors to select when choosing your cabinets. 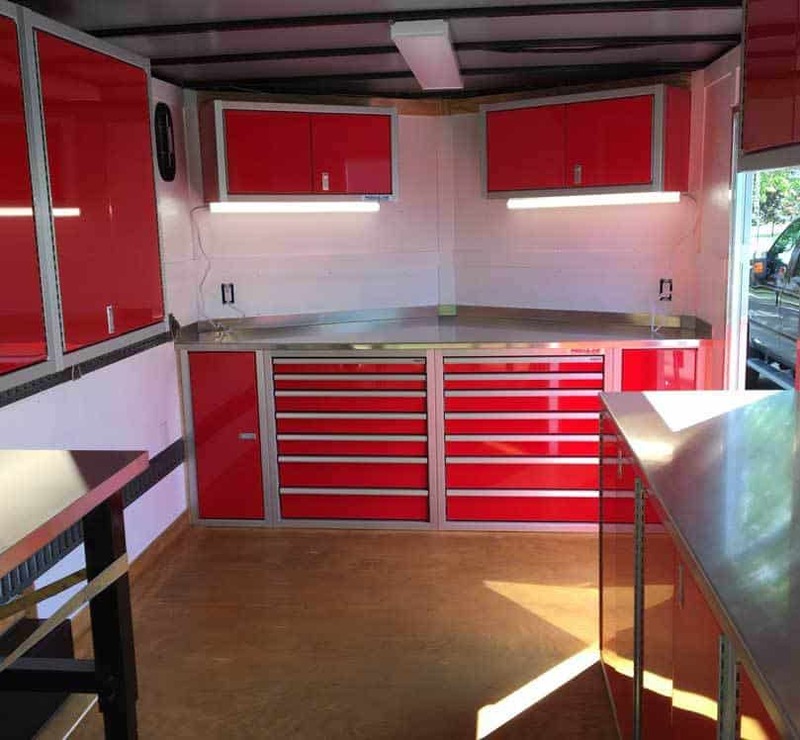 Cabinets in an enclosed trailer are a fantastic value for everyone from professional landscape companies to amateur race teams. Benefits include protecting small items from damage, making the most of vertical space, and keeping the inside of your trailer neat and organized. The Moduline Cabinets system offers several accessories such as liners, drawer dividers, and drawer bins. These items can help you organize tools and small car parts that can easily get lost among larger items. There are also fuel and helmet holders as well as lighting options available. Moduline Cabinets has two lines of high-alloy aluminum cabinet series available. Our PRO II™ Series is a fully customizable line of professional grade high-alloy aluminum cabinets for mobile storage. 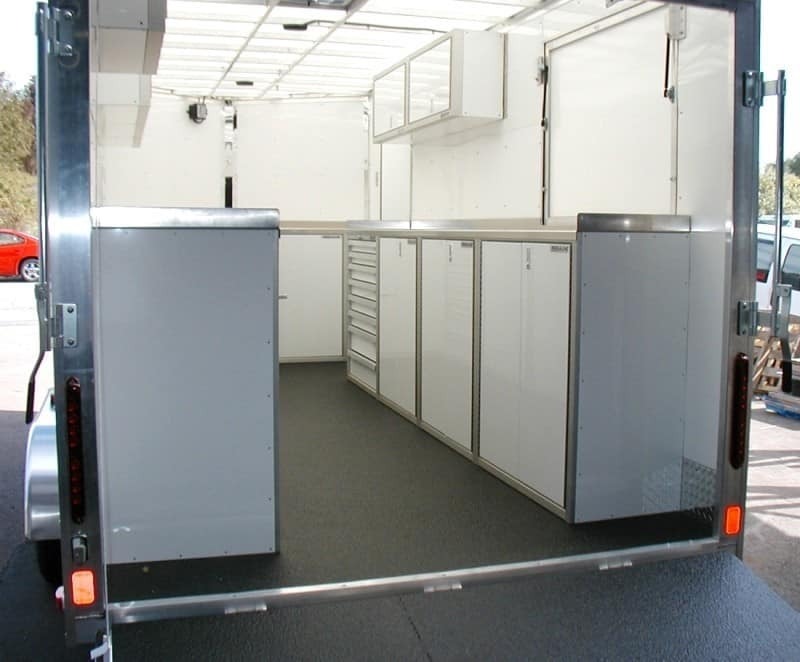 Our Sportsman II™ Series are pre-configured modular cabinets for trailers and vehicles. The Sportsman II™ Series mobile aluminum cabinets incorporate many of the best elements from the PRO II™ Series. These are packaged in a value focused system. They have been redesigned with lightweight, military-grade aluminum. These cabinets include features such as patented QuikDraw® technology, attractive gray-colored frames, and an adjustable shelf system. The lightweight design makes them easily mobile. The Sportsman II™ or PRO II™ Series is a great way to have high quality cabinets in your trailer! Call our cabinet experts for a free consultation for your layout at 888-343-4463 or click the link to get started.